Korean (한국어/조선말, see below) is the official language of South Korea and North Korea, as well as one of the two official languages in China's Yanbian Korean Autonomous Prefecture. About 80 million people speak Korean worldwide. For over a millennium, Korean was written with adapted Chinese characters called hanja, complemented by phonetic systems like hyangchal, gugyeol, and idu. In the 15th century, a national writing system called Hangeul was commissioned by Sejong the Great, but it only came into widespread use in the 20th century, because of the yangban aristocracy's preference for hanja. Some historical linguists classify Korean as a language isolate, while others consider it to be in the controversial Altaic language family. The Korean language is agglutinative in its morphology and SOV in its syntax. The Korean names for the language are based on the names for Korea used in North and South Korea. In South Korea, the language is most often called Hangungmal (한국말), consisting of Hanguk (한국, /hɐːnguk̚/), the South Korean name for Korea, and mal (말, /mal/), meaning "speech"; the /k̚/ at the end of the first word becomes /ŋ/ by the rules of consonant assimilation in Korean phonology. More formally, it may also be called Hangugeo (한국어)Gugeo (국어); literally "national language"). In North Korea and Yanbian Korean Autonomous Prefecture in China, the language is most often called Chosŏnmal (조선말), or more formally, Chosŏnŏ (조선어). The English word "Korean" is derived from Goryeo (고려), which is thought to be the first dynasty known to Western countries. Korean people in the former USSR, who refer to themselves as Koryo-saram (고려사람; also Goryeo In [고려인; 高麗人; literally, "Goryeo person(s)"]) call the language Goryeo Mal (고려말). In mainland China, following the establishment of diplomatic relations with South Korea in 1992, the term Cháoxiǎnyǔ (朝鲜语 or the short form: Cháoyǔ (朝语)) has normally been used to refer to the standard language of North Korea and Yanbian, while Hánguóyǔ (韩国语 or the short form: Hányǔ (韩语)) is used to refer to the standard language of South Korea. Some older English sources also use the spelling "Corean" to refer to the language, country, and people. Korean is far from the Altaic languages in good at most grammatical elements, including articles, fusional morphology, and relative pronouns. Since Ramstedt's 1928 article, some linguists support the hypothesis that Korean can be classified as an Altaic language or as a relative of proto-Altaic. However, linguists agree today that typological resemblances cannot be used to prove genetic relatedness of languages, as these features are typologically connected and easily borrowed. Such factors of typological divergence as Middle Mongolian's exhibition of gender agreement can be used to argue that a genetic relationship is unlikely. The hypothesis that Korean might be related to Japanese has had some supporters due to some apparent overlap in vocabulary and similar grammatical features that have been elaborated upon by such researchers as Samuel E. Martin and Roy Andrew Miller. Sergei Anatolyevich Starostin (1991) found about 25% of potential cognates in the Japanese–Korean 100-word Swadesh list, which—if valid—would place these two languages closer together than other possible members of the Altaic family. Among ancient languages, various closer relatives of Korean have been proposed, constituting a possible small Koreanic language family. Some classify the language of Jeju Island as a distinct modern Koreanic language. Korean is descended from Proto-Korean, Old Korean, Middle Korean, and Modern Korean. 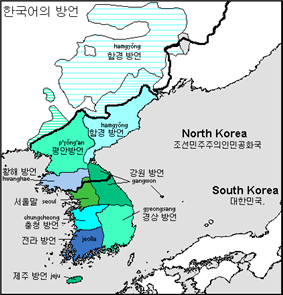 Since the Korean War, contemporary North–South differences have developed in standard Korean, including variance in pronunciation, verb inflection, and vocabulary. Korean is spoken by the Korean people in North Korea and South Korea and by the Korean diaspora in many countries including the People's Republic of China, the United States, Japan, and Russia. Korean-speaking minorities exist in these states, but because of cultural assimilation into host countries, not all ethnic Koreans may speak it with native fluency. Korean is the official language of South Korea and North Korea. It is also one of the two official languages of the Yanbian Korean Autonomous Prefecture in China. In South Korea, the regulatory body for Korean is the Seoul-based National Institute of the Korean Language (국립국어원; 國立國語院), which was created by presidential decree on January 23, 1991. In North Korea, the regulatory body is the Language Institute of the Academy of Social Sciences (사회과학원 어학연구소; 社會科學院語學研究所, Sahoe Kwahagwon Ŏhak Yŏnguso). Korean has numerous small local dialects (called mal (말) [literally "speech"], saturi (사투리), or bang'eon (방언) in Korean). The standard language (pyojuneo or pyojunmal) of both South Korea and North Korea is based on the dialect of the area around Seoul, though the northern standard has been influenced by the dialect of P'yŏngyang. All dialects of Korean are similar to each other and at least partially mutually intelligible, though the dialect of Jeju Island is divergent enough to be sometimes classified as a separate language. One of the more salient differences between dialects is the use of tone: speakers of Seoul dialect make use of vowel length, whereas speakers of the Gyeongsang dialect maintain the pitch accent of Middle Korean. Some dialects are conservative, maintaining Middle Korean sounds (such as z, β, ə) which have been lost from the standard language, whereas others are highly innovative. There is substantial evidence for a history of extensive dialect levelling, or even convergent evolution or intermixture of two or more originally distinct linguistic stocks, within the Korean language and its dialects. Many Korean dialects have basic vocabulary that is etymologically distinct from vocabulary of identical meaning in Standard Korean or other dialects, such as South Jeolla dialect /kur/ vs. Standard Korean 입 /ip/ "mouth" or Gyeongsang dialect /t͡ɕʌŋ.ɡu.d͡ʑi/ vs. Standard Korean /puːt͡ɕʰu/ "garlic chives". This suggests that the Korean Peninsula may have at one time been much more linguistically diverse than it is at present. See also the Buyeo languages hypothesis. There are few clear boundaries between Korean dialects, and they are typically partially grouped according to the regions of Korea. Munhwaŏ Northern standard. Based on Seoul dialect. 1 The liquids /w/ and /j/ are represented in Korean writing by modifications to vowel symbols (see below). The IPA symbol ⟨◌͈⟩ (a subscript double straight quotation mark, shown here with a placeholder circle) is used to denote the tensed consonants /p͈/, /t͈/, /k͈/, /t͡ɕ͈/, /s͈/. Its official use in the Extensions to the IPA is for 'strong' articulation, but is used in the literature for faucalized voice. The Korean consonants also have elements of stiff voice, but it is not yet known how typical this is of faucalized consonants. They are produced with a partially constricted glottis and additional subglottal pressure in addition to tense vocal tract walls, laryngeal lowering, or other expansion of the larynx. ^* ㅏ is closer to a near-open central vowel ([ɐ]), though ⟨a⟩ is still used for tradition. /s/ is aspirated [sʰ] and becomes an alveolo-palatal [ɕʰ] before [j] or [i] for most speakers (but see North–South differences in the Korean language). This occurs with the tense fricative and all the affricates as well. At the end of a syllable, /s/ changes to /t/ (Example: beoseot (버섯) 'mushroom'). /h/ may become a bilabial [ɸ] before [o] or [u], a palatal [ç] before [j] or [i], a velar [x] before [ɯ], a voiced [ɦ] between voiced sounds, and a [h] elsewhere. /p, t, t͡ɕ, k/ become voiced [b, d, d͡ʑ, ɡ] between voiced sounds. /m, n/ frequently denasalize to [b, d] at the beginnings of words. /l/ becomes alveolar flap [ɾ] between vowels, and [l] or [ɭ] at the end of a syllable or next to another /l/. Note that a written syllable-final 'ㄹ', when followed by a vowel or a glide (i.e., when the next character starts with 'ㅇ'), migrates to the next syllable and thus becomes [ɾ]. Traditionally, /l/ was disallowed at the beginning of a word. It disappeared before [j], and otherwise became /n/. However, the inflow of western loanwords changed the trend, and now word-initial /l/ (mostly from English loanwords) are pronounced as a free variation of either [ɾ] or [l]. The traditional prohibition of word-initial /l/ became a morphological rule called "initial law" (두음법칙) in South Korea, which pertains to Sino-Korean vocabulary. Such words retain their word-initial /l/ in North Korea. All obstruents (plosives, affricates, fricatives) at the end of a word are pronounced with no audible release, [p̚, t̚, k̚]. Plosive stops /p, t, k/ become nasal stops [m, n, ŋ] before nasal stops. Hangeul spelling does not reflect these assimilatory pronunciation rules, but rather maintains the underlying, partly historical morphology. Given this, it is sometimes hard to tell which actual phonemes are present in a certain word. Grammatical morphemes may change shape depending on the preceding sounds. Examples include -eun/-neun (-은/-는) and -i/-ga (-이/-가). Sometimes sounds may be inserted instead. Examples include -eul/-reul (-을/-를), -euro/-ro (-으로/-로), -eseo/-seo (-에서/-서), -ideunji/-deunji (-이든지/-든지) and -iya/-ya (-이야/-야). However, -euro/-ro is somewhat irregular, since it will behave differently after a rieul consonant. Some verbs may also change shape morphophonemically. Korean is an agglutinative language. The Korean language is traditionally considered to have nine parts of speech. For details, see Korean parts of speech. Modifiers generally precede the modified words, and in the case of verb modifiers, can be serially appended. The basic form of a Korean sentence is subject–object–verb, but the verb is the only required and immovable element. The relationship between a speaker or writer and his or her subject and audience is paramount in Korean, and the grammar reflects this. The relationship between speaker/writer and subject referent is reflected in honorifics, while that between speaker/writer and audience is reflected in speech level. When talking about someone superior in status, a speaker or writer usually uses special nouns or verb endings to indicate the subject's superiority. Generally, someone is superior in status if he/she is an older relative, a stranger of roughly equal or greater age, or an employer, teacher, customer, or the like. Someone is equal or inferior in status if he/she is a younger stranger, student, employee or the like. Nowadays, there are special endings which can be used on declarative, interrogative, and imperative sentences; and both honorific or normal sentences. They are made for easier and faster use of Korean. Honorifics in traditional Korea were strictly hierarchical. The caste and estate systems possessed patterns and usages much more complex and stratified than those used today. The intricate structure of the Korean honorific system flourished in traditional culture and society. Honorifics in contemporary Korea are now used for people who are psychologically distant. Honorifics are also used for people who are superior in status. For example, older relatives, people who are older, teachers, and employers. There are seven verb paradigms or speech levels in Korean, and each level has its own unique set of verb endings which are used to indicate the level of formality of a situation. Unlike honorifics—which are used to show respect towards the referent (the person spoken of) —speech levels are used to show respect towards a speaker's or writer's audience (the person spoken to). The names of the seven levels are derived from the non-honorific imperative form of the verb 하다 (hada, "do") in each level, plus the suffix 체 ("che", hanja: 體), which means "style". The highest six levels are generally grouped together as jondaenmal (존댓말), while the lowest level (haeche, 해체) is called banmal (반말) in Korean. Nowadays, younger-generation speakers no longer feel obligated to lower their usual regard toward the referent. It is common to see younger people talk to their older relatives with banmal (반말). This is not out of disrespect, but instead it shows the intimacy and the closeness of the relationship between the two speakers. Transformations in social structures and attitudes in today's rapidly changing society have brought about change in the way people speak. Traditionally Korean women are often viewed as subservient to men, and this in turn is observed in their everyday speech patterns. Some examples of this can be seen in: (1) a woman’s use of softer tone in order to minimize conflict or aggression; (2) a married woman introducing herself as someone’s mother or wife, not with her own name; (3) the presence of gender differences in titles and occupational terms (for example, a sajang is a company president and yŏsajang is a female company president. ); (4) and females sometimes using more tag questions and rising tones in statements, much like the way that young children talk. In Western societies, individuals won't avoid expressions of power asymmetry, mutually addressing each other by their first names for the sake of solidarity. Between two people of asymmetrical status in a Korean society, people tend to emphasize differences in status for the sake of solidarity. Koreans prefer to use kinship terms rather than any other terms of reference. In traditional Korean society, women have long been in disadvantaged positions. Korean social structure traditionally consisted of a royal monarch, a patriarchically dominated family system that emphasizes the maintenance of family lines. This structure has tended to separate roles of women from those of men. The exact proportion of Sino-Korean vocabulary is a matter of debate. Sohn (2001) stated 50–60%. Later, the same author (2006, p. 5) gives an even higher estimate of 65%. Jeong Jae-do, one of the compilers of the dictionary Urimal Keun Sajeon, asserts that the proportion is not so high. He points out that Korean dictionaries compiled during the colonial period include many unused Sino-Korean words. In his estimation, the proportion of native Korean vocabulary in the Korean language might be as high as 70%. Korean has two numeral systems: one native, and one borrowed from Sino-Korean. To a much lesser extent, some words have also been borrowed from Mongolian and other languages. Conversely, the Korean language itself has also contributed some loanwords to other languages, most notably the Tsushima dialect of Japanese. The vast majority of loanwords other than Sino-Korean come from modern times, approximately 90% of which are from English. Many words have also been borrowed from Western languages such as German via Japanese (아르바이트 (areubaiteu) "part-time job", 알레르기 (allereugi) "allergy", 기브스 (gibseu or gibuseu) "plaster cast used for broken bones"). Some Western words were borrowed indirectly via Japanese during the Japanese occupation of Korea, taking a Japanese sound pattern, for example "dozen" > ダース dāsu > 다스 daseu. Most indirect Western borrowings are now written according to current "Hangeulization" rules for the respective Western language, as if borrowed directly. There are a few more complicated borrowings such as "German(y)" (see names of Germany), the first part of whose endonym [ˈd̥ɔɪ̯t͡ʃʷ.la̠ntʰ] the Japanese approximated using the kanji 獨逸 doitsu that were then accepted into the Korean language by their Sino-Korean pronunciation: 獨 dok + 逸 il = Dogil. In South Korean official use, a number of other Sino-Korean country names have been replaced with phonetically oriented "Hangeulizations" of the countries' endonyms or English names. Because of such a prevalence of English in modern Korean culture and society, lexical borrowing is inevitable. English-derived Korean, or 'Konglish' (콩글리쉬), is increasingly used. The vocabulary of the Korean language is roughly 5% loanwords (excluding Sino-Korean vocabulary). As in Japanese, Korean uses words adapted from English in ways that may seem strange to native English speakers. For example, in soccer heading (헤딩) is used as a noun meaning a 'header', while fighting (화이팅) is a term of encouragement like 'come on'/'go (on)' in English. Something that is 'service' (서비스) is free or 'on the house'. A building referred to as an 'apart-uh' (아파트) is an 'apartment' (but in fact refers to a residence more akin to a condominium) and a type of pencil that is called a 'sharp' (샤프) is a mechanical pencil. North Korean vocabulary shows a tendency to prefer native Korean over Sino-Korean or foreign borrowings, especially with recent political objectives aimed at eliminating foreign influences on the Korean language in the North. In the early years, the North Korean government tried to eliminate Sino-Korean words. Consequently, South Korean may have several Sino-Korean or foreign borrowings which are not in North Korean. The use of slang has become very popular in South Korea since the emergence of the Internet, and is particularly prevalent in social media. In 2012, research was conducted about the frequency of slang use among students which found that 97% of K-12 students, including 100% of middle and high school students, used slang. One of the main reasons why slang is used so much is its extensive use in media both social (such as Facebook and KakaoTalk) and more traditional (such as television and movies). The influence of slang can be seen as both positive and negative. Many Koreans use a particular style of slang in which longer words are shortened to save time, which is especially common when using chat services. Examples of this slang include '버정' instead of '버스 정류장' (bus stop), and '멘붕' instead of '멘탈 붕괴' (mental breakdown). However, there are also negative aspects to the use of slang, the greatest concern being that teenagers will sometimes use slang in their academic writing. Formerly, the languages of the Korean peninsula were written using hanja, called hyangchal or idu: the use of Chinese characters either as rebuses to stand for Korean words, or as synonyms for those words. Writing was confined to the ruling elite, who most often wrote only in Classical Chinese. 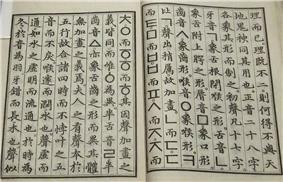 Sejong the Great promulgated the Korean alphabet in 1446. Korean is now written almost exclusively in Hangeul. While South Korean schools still teach 1,800 hanja, North Korea abolished hanja decades ago. Modern Korean is written with spaces between words, a feature not found in Chinese or Japanese. Korean punctuation marks are almost identical to Western ones. 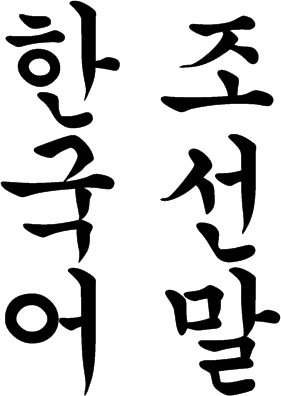 Traditionally, Korean was written in columns, from top to bottom, right to left, but is now usually written in rows, from left to right, top to bottom. The Korean language used in the North and the South exhibits differences in pronunciation, spelling, grammar and vocabulary. In North Korea, palatalization of /si/ is optional, and /t͡ɕ/ can be pronounced [z] between vowels. Words that are written the same way may be pronounced differently, such as the examples below. The pronunciations below are given in Revised Romanization, McCune–Reischauer and Hangeul, the last of which represents what the Hangeul would be if one were to write the word as pronounced. Some words are spelled differently by the North and the South, but the pronunciations are the same. 해빛 햇빛 sunshine haeppit (haepit) The "sai siot" ('ㅅ' used for indicating sound change) is almost never written out in the North. 못읽다 못 읽다 cannot read modikda (modikta) Spacing. 한나산 한라산 Hallasan hallasan (hallasan) When a ㄴ-ㄴ combination is pronounced as ll, the original Hangeul spelling is kept in the North, while the Hangeul is changed in the South. 규률 규율 rules gyuyul (kyuyul) In words where the original hanja is spelt "렬" or "률" and follows a vowel, the initial ㄹ is not pronounced in the North, making the pronunciation identical with that in the South where the ㄹ is dropped in the spelling. 력량 ryeongryang (ryŏngryang) 역량 yeongnyang (yŏngnyang) strength Initial r's are dropped if followed by i or y in the South Korean version of Korean. 로동 rodong (rodong) 노동 nodong (nodong) work Initial r's are demoted to an n if not followed by i or y in the South Korean version of Korean. 원쑤 wonssu (wŏnssu) 원수 wonsu (wŏnsu) mortal enemy "Mortal enemy" and "field marshal" are homophones in the South. Possibly to avoid referring to Kim Il-sung, Kim Jong-il or Kim Jong-un as the enemy, the second syllable of "enemy" is written and pronounced 쑤 in the North. 꾸바 kkuba (kkuba) 쿠바 kuba (k'uba) Cuba When transcribing foreign words from languages that do not have contrasts between aspirated and unaspirated stops, North Koreans generally use tensed stops for the unaspirated ones while South Koreans use aspirated stops in both cases. 페 pe (p'e) 폐 pye (p'ye), pe (p'e) lungs In the case where ye comes after a consonant, such as in hye and pye, it is pronounced without the palatal approximate. North Korean orthography reflect this pronunciation nuance. 되였다 doeyeotda (toeyŏtta) 되었다 doeeotda (toeŏtta) past tense of 되다 (doeda/toeda), "to become" All similar grammar forms of verbs or adjectives that end in ㅣ in the stem (i.e. ㅣ, ㅐ, ㅔ, ㅚ, ㅟ and ㅢ) in the North use 여 instead of the South's 어. 고마와요 gomawayo (komawayo) 고마워요 gomawoyo (komawŏyo) thanks ㅂ-irregular verbs in the North use 와 (wa) for all those with a positive ending vowel; this only happens in the South if the verb stem has only one syllable. 할가요 halgayo (halkayo) 할까요 halkkayo (halkkayo) Shall we do? Although the Hangeul differ, the pronunciations are the same (i.e. with the tensed ㄲ sound). 문화주택 munhwajutaek (munhwajut'aek) 아파트 apateu (ap'at'ŭ) Apartment 아빠트 (appateu/appat'ŭ) is also used in the North. 동무 dongmu (tongmu) 친구 chingu (ch'ingu) Friend 동무 was originally a non-ideological word for "friend" used all over the Korean peninsula, but North Koreans later adopted it as the equivalent of the Communist term of address "comrade". As a result, to South Koreans today the word has a heavy political tinge, and so they have shifted to using other words for friend like "친구", "벗" (beot/pŏt). In the North, guillemets 《 and 》 are the symbols used for quotes; in the South, quotation marks equivalent to the English ones, “ and ”, are standard, although 『 』 and 「 」 are also used. For native English speakers, Korean is generally considered to be one of the most difficult languages to master despite the relative ease of learning Hangeul. For instance, the United States' Defense Language Institute places Korean in Category IV, which also includes Arabic, Japanese, and Chinese. This means that 63 weeks of instruction (as compared to just 25 weeks for French, Spanish, Portuguese, and Italian) are required to bring an English-speaking student to a limited working level of proficiency in which he or she has "sufficient capability to meet routine social demands and limited job requirements" and "can deal with concrete topics in past, present, and future tense." Similarly, the Foreign Service Institute places Korean in Category V, the highest level of difficulty. The study of the Korean language in the United States is dominated by Korean American heritage language students; they are estimated to form over 80% of all students of the language at non-military universities. However, Sejong Institutes in the United States have noted a sharp rise in the number of people of other ethnic backgrounds studying Korean between 2009 and 2011; they attribute this to rising popularity of South Korean music and television shows. Korean is considerably easier for speakers of certain other languages, such as Japanese; in Japan, it is more widely studied by non-heritage learners. There are two widely used tests of Korean as a foreign language: the Korean Language Proficiency Test (KLPT) and the Test of Proficiency in Korean (TOPIK). The Korean Language Proficiency Test, an examination aimed at assessing non-native speakers' competence in Korean, was instituted in 1997; 17,000 people applied for the 2005 sitting of the examination. The TOPIK was first administered in 1997 and was taken by 2,274 people. Since then the total number of people who have taken the TOPIK has surpassed 1 million, with more than 150,000 candidates taking the test in 2012. The TOPIK test has three different difficulty levels: beginner, intermediate, and advanced; the difficulty level of the test taken determines the level achieved—the beginner test is levels 1 and 2; intermediate is levels 3 and 4; and advanced is levels 5 and 6. The TOPIK includes four sections: vocabulary/grammar (어휘및 문법), writing (쓰기), listening (듣기), and reading (읽기). The vocabulary/grammar section, listening section, and reading section each consist of 30 multiple choice questions worth a total of 100 points. The writing section consists of 10 multiple-choice questions worth 4 points each, and 4-6 written responses worth 60 points. The overall total score out of 400 is determined by adding up the 4 scores from each individual 100-point section. However, the level achieved is not simply a matter of achieving a minimum total score; the test-taker must achieve a minimum score in each section in addition to a minimum average total score. In order to achieve the lower of the two levels on each test (levels 1, 3, and 5), the test-taker must get at least 40 points in each of the four sections, and must get an average total score of 50 on the four sections. In order to achieve the higher of the two levels on each test (levels 2, 4, and 6), the test-taker must get at least 50 points in each of the four sections, and must get an average total score of 70 on the four sections. ^ "Ethnologue: Languages of the World 2010". ^ Nordhoff, Sebastian; Hammarström, Harald; Forkel, Robert; Haspelmath, Martin, eds. (2013). "Korean". Glottolog 2.2. Leipzig: Max Planck Institute for Evolutionary Anthropology. David Dalby. 1999/2000. The Linguasphere Register of the World's Languages and Speech Communities. Linguasphere Press. ^ Starostin, Sergei (1991). ]The Altaic Problem and the Origins of the Japanese Language [Altaiskaya problema i proishozhdeniye yaponskogo yazika. Moscow: Nauka. ^ Source: Unescopress. "New interactive atlas adds two more endangered languages | United Nations Educational, Scientific and Cultural Organization". Unesco.org. Retrieved 2013-12-11. ^ a b c d Sohn, Ho-Min (2006). Korean Language in Culture and Society. Boston: Twayne Publishers. ^ Cho, Young A. “ Gender Differences in Korean Speech.” Korean Language in Culture and Society. Ed. Ho-min Sohn. University of Hawaii Press, 2006. pp. 189–98. ^ Kim, Minju. “Cross Adoption of language between different genders: The case of the Korean kinship terms hyeng and enni.” Proceedings of the Fifth Berkley Woman and Language Conference. Berkeley: Berkeley Women and Language Group. 1999. ^ Palley, Marian Lief. “Women’s Status in South Korea: Tradition and Change.” Asian Survey, Vol 30 No. 12. December 1990. pp. 1136–53. ^ a b c Sohn, Ho-Min. The Korean Language (Section 1.5.3 "Korean vocabulary", pp. 12–13), Cambridge University Press, 2001. ISBN 0-521-36943-6. ^ Kim, Jin-su (2009-09-11). "우리말 70%가 한자말? 일제가 왜곡한 거라네/Our language is 70% hanja? Japanese Empire distortion". The Hankyoreh. Retrieved 2009-09-11. . The dictionary mentioned is "우리말　큰 사전". Seoul: Hangeul Hakhoe. 1992. ^ "Beliefs that bind". Korea JoongAng Daily. 2007-10-23. Retrieved 2012-08-16. ^ Raugh, Harold E. "The Origins of the Transformation of the Defense Language Program". Applied Language Learning 16 (2): 1–12. Retrieved 2008-01-09. ^ "Language Difficulty Ranking". Effective Language Learning. Retrieved 2013-12-11. ^ Lee, Saekyun H.; HyunJoo Han. "Issues of Validity of SAT Subject Test Korea with Listening". Applied Language Learning 17 (1): 33–56. Archived from the original on 2008-06-25. ^ "Global popularity of Korean language surges". Korea Herald. 2012-07-22. Retrieved 2012-08-16. ^ Fujita-Round, Sachiyo; John C. Maher (2007). "Language Education Policy in Japan". Language policy and political issues in education. Encyclopedia of Language and Education (United States: Springer). pp. 393–404. ^ "Korea Marks 558th Hangeul Day". The Chosun Ilbo. 2004-10-10. Archived from the original on 2008-02-19. Retrieved 2008-01-09. ^ "Korean language test-takers pass 1 mil.". Argüelles, Alexander, and Jong-Rok Kim (2000). A Historical, Literary and Cultural Approach to the Korean Language. Seoul: Hollym. Argüelles, Alexander, and Jongrok Kim (2004). A Handbook of Korean Verbal Conjugation. Hyattsville, Maryland: Dunwoody Press. Arguelles, Alexander (2007). Korean Newspaper Reader. Hyattsville, Maryland: Dunwoody Press. Chang, Suk-jin (1996). Korean. Philadelphia: John Benjamins Publishing Company. (Volume 4 of the London Oriental and African Language Library). Hulbert, Homer B. (1905). A Comparative Grammar of the Korean Language and the Dravidian Dialects in India. Seoul. Lee, Ki-Moon; Ramsey, S. Robert (2011). A History of the Korean Language. Martin, Samuel E. (1966). Lexical Evidence Relating Japanese to Korean. Language 42/2: 185–251. Martin, Samuel E. (1990). Morphological clues to the relationship of Japanese and Korean. In: Philip Baldi (ed. ): Linguistic Change and Reconstruction Methodology. Trends in Linguistics: Studies and Monographs 45: 483–509. Martin, Samuel E. (2006). A Reference Grammar of Korean: A Complete Guide to the Grammar and History of the Korean Language – 韓國語文法總監. Miller, Roy Andrew (1971). Japanese and the Other Altaic Languages. Chicago: University of Chicago Press. ISBN 0-226-52719-0. Miller, Roy Andrew (1996). Languages and History: Japanese, Korean and Altaic. Oslo: Institute for Comparative Research in Human Culture. ISBN 974-8299-69-4. Ramstedt, G. J. (1928). Remarks on the Korean language. Mémoires de la Société Finno-Oigrienne 58. Rybatzki, Volker (2003). Middle Mongol. In: Juha Janhunen (ed.) (2003): The Mongolic languages. London: Routledge. ISBN 0-7007-1133-3: 47–82. Starostin, Sergei A., Anna V. Dybo, and Oleg A. Mudrak (2003). Etymological Dictionary of the Altaic Languages, 3 volumes. Leiden: Brill Academic Publishers. ISBN 90-04-13153-1. Sohn, H.-M. (1999). The Korean Language. Cambridge: Cambridge University Press. Sohn, Ho-Min (2006). Korean Language in Culture and Society. Boston: Twayne Publishers. Song, J.-J. (2005). The Korean Language: Structure, Use and Context. London: Routledge. Trask, R. L. (1996). Historical linguistics. Hodder Arnold. Vovin, Alexander (2010). Koreo-Japonica: A Re-evaluation of a Common Genetic Origin. Honolulu: University of Hawai'i Press. Whitman, John B. (1985). The Phonological Basis for the Comparison of Japanese and Korean. Unpublished Harvard University Ph.D. dissertation. Yele – West New Britain? Families in bold are the largest. Families in italics have no living members.